Gareth Anscombe scored his first points for Cardiff Blues with a conversion in the 36-25 win over Treviso. 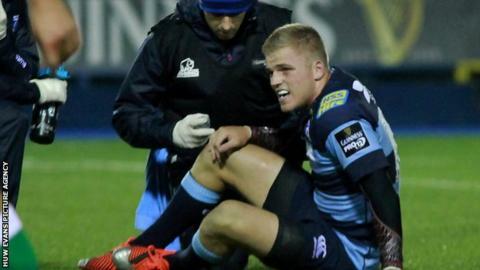 Cardiff Blues will wait until Tuesday to decide whether to register Gareth Anscombe for their European matches. Wales-qualified Anscombe suffered a dead leg and was substituted at half-time of the 36-25 win over Treviso. Blues face London Irish in the European Challenge Cup on consecutive weekends, and can register only one new player before this round of matches. "Gareth has a haematoma on the leg - 28 or 48 hours will determine how that is," said coach Mark Hammett. "It's one of those injuries - some players will turn up and it won't be too bad, with other players you will need a week. "They're not normally long-term but they can be a bit touch and go." Anscombe made his debut for the Blues against Edinburgh on 23 November after joining from Waikato Chiefs in New Zealand. Joaquin Tuculet has played 20 times for the Pumas and scored six tries in internationals. If Anscombe does not recover in time, the region could register either of their Argentina internationals Lucas Amorosino or Joaquin Tuculet instead. The latter made an impressive try-scoring debut at the Arms Park as the Blues registered their first home league win of the season against Treviso. Coach Hammett could also have Wales captain Sam Warburton back for the match against London Irish at the Arms Park on 6 December after the Test match against South Africa. "I've spoken to Warby and he said he was quite keen to come back in," added Hammett. "But I said let's get through the [South] African game and then reassess. So hopefully he comes through that not just fit, but feeling good." Blues' win over Treviso was just their second in the league this season - the first coming on the opening day of the season against Zebre. They remain ninth in the table, but have opened a six point gap over Welsh rivals Newport Gwent Dragons. "The boys have been superb from a preparation perspective," said Hammett. "We've had another good training week on a very short turn around and I thought the boys for the best part of the game were pretty good."